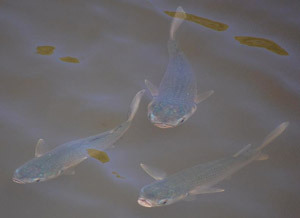 Six native fish species live in the freshwater section of Wolli Creek and can sometimes be seen above the Henderson Street weir. 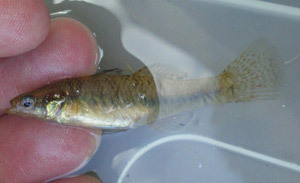 These are: Empire Gudgeon (Hypseleotris compressa), Flathead Gudgeon (Philypnodon grandiceps), Striped Gudgeon (Gobiomorphus australis), Firetail Gudgeon (Hypseleotris galii), Common Galaxia (Galaxis maculatus) and Long-Finned Eel (Anguilla reinhardtii). 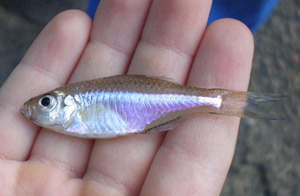 Little was known about the fresh and salt water fish species to be found in Wolli Creek until baseline sampling was carried out by the NSW Department of Primary Industry in November 2007, in advance of the installation of a Fishway at Turrella Weir. 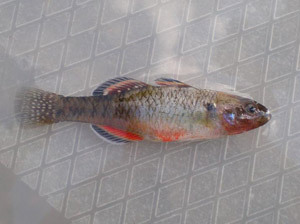 In the brackish to salt water immediately below the weir, the following species were collected: Sea Mullett (Mugil cephalus), Yellow-fin Bream (Acanthopagris australia), Port Jackson Perchlet (Ambassis jacksoniensis) and Toadfish (Tetractenos sp.). The Fishway was constructed in the Wolli Creek weir in 2009 to allow native fish to travel through the weir to freshwater up stream. 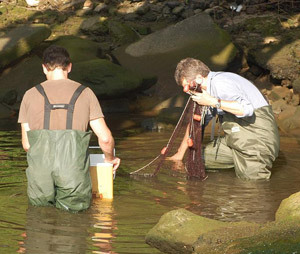 This allows for fish migration and is a positive step towards securing a future for our native fish and fisheries. 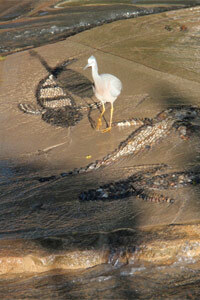 At high tide, the fish can use the Fishway as a ladder, so that they can move up through the weir in stages. To see how they do this, have a look at Scaling the Wolli Fish Ladder on youtube (www.youtube.com/watch?v=Lq-wzocd0B0), filmed by one of our members, Gavin Gatenby. What the video doesn’t show is a very enterprising grey heron who often waits to catch the fish at the top of the ladder. The site is now complete with interpretive signage and artwork. 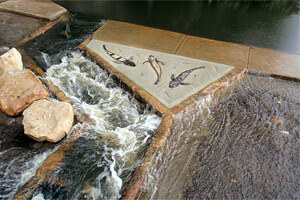 The artwork includes three pebble mosaics depicting fish travelling up and down the fishway, which can be viewed from the foot bridge which crosses Wolli Creek at the weir. 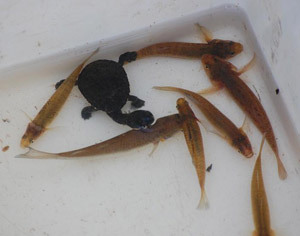 An Eastern long-necked turtle was also caught during fish sampling – see our reptiles page for more information.